Programmable keyboards let you assign custom key actions, rearrange keys, record macros, and much more. Choose the right one to increase your comfort and boost your productivity. There are two types of programmable keyboards: those that let you reprogram any key on the keyboard (“fully-programmable”) and those that add extra keys to the keyboard for programming macros. 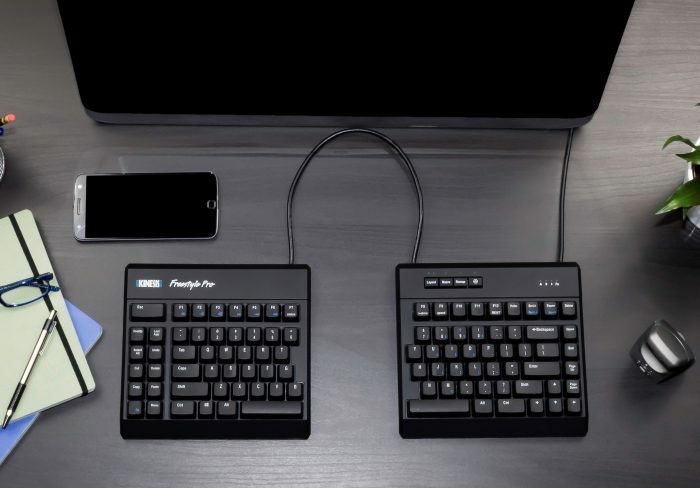 Programmable keyboards are popular with gamers who use high-powered macros and require extra keys to trigger them, but programmable keyboards are also powerful productivity tools at home or in the office. 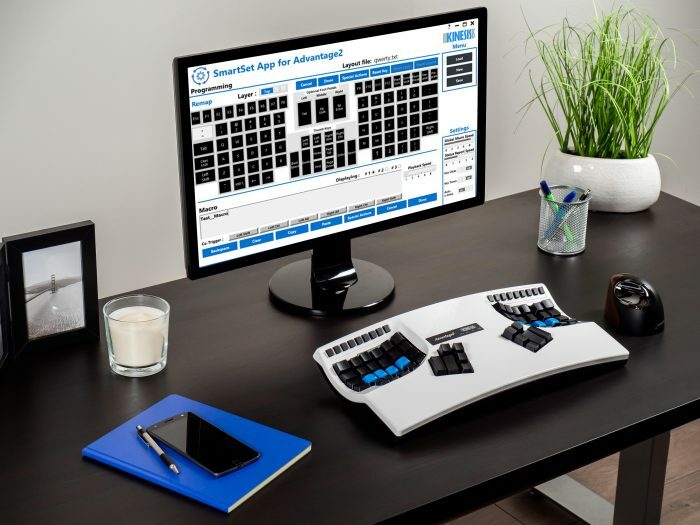 Kinesis has a lot of experience making fully-programmable keyboards such as our new Advantage2 and Freestyle Pro keyboards featuring our SmartSet Programming Engine. Read this guide to learn how a programmable keyboard can help increase your productivity, and even make you more comfortable. Regardless of which keyboard layout you prefer to use (Learn more about alternatives to QWERTY), not every key is going to be in the optimal position based on your physiology, typing style, preferences, and specific workflow. Programmable keyboards recognize this important fact and allow you to electronically move keys from one position to another (Kinesis calls this “remapping” but others refer to this practice as “key binding”) and in many cases interchange the physical keycaps. For example, an author may be perfectly happy with the standard QWERTY layout, but QWERTY may be wholly inadequate for a software developer who could benefit immensely from a custom keyboard layout. The reason is most software languages require extensive use of the modifier keys, punctuation keys, and function keys, but those keys were positioned on a conventional keyboard decades ago when keyboard users were typing mostly prose. One common remap is to swap the Escape key, frequently used in coding, with the Caps Lock key, which has very little value to the vast majority of keyboard users. Arrow keys, navigation keys (e.g. Page Up, Page Down, Home and End) can also be re-positioned for improved access. You can even add key actions that don’t even appear on the keyboard like F13 through F24! If you’re a software engineer writing millions of lines of code a year, for your entire career, would you rather have your body adapt to a keyboard designed for a 19th century typist writing small amounts of prose, or would you rather have a programmable keyboard which you can customize to meet your specific workflow? That’s what we thought! 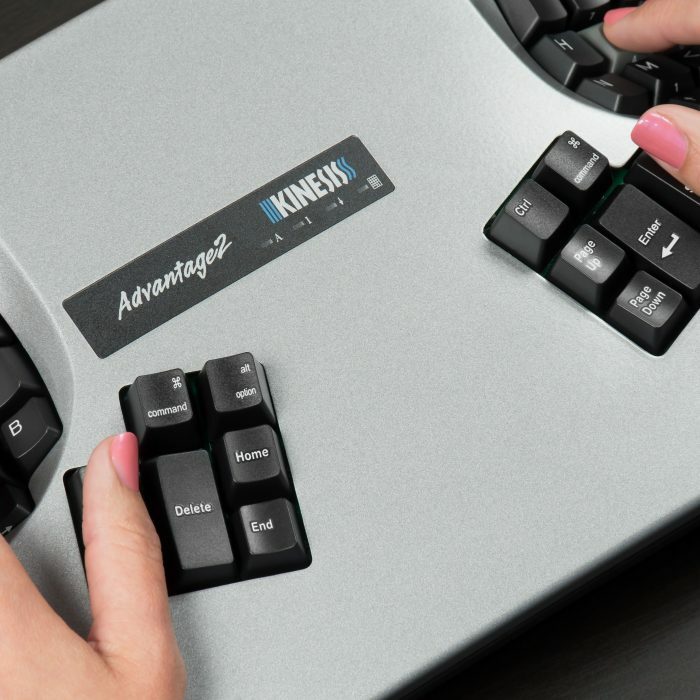 The best programmable keyboards (like those made by Kinesis) allow users to create multiple layouts which can be used interchangeably depending on the task, application, or user. To learn more about how software engineers can benefit from a programmable keyboard read our Ergonomics for Developers guide. On the average keyboard (and even many programmable keyboards), each physical key can only perform one single action. This is kind of a waste when you think about it! One way to make a programmable keyboard more versatile is to add a second “layer” of key actions. A second layer allows a single key to perform two separate actions depending on which layer is active. Many laptop keyboards make use of a second layer (accessed with the “Fn” key) since they are space constrained. An “embedded” layer boosts productivity by doubling the functional size of your keyboard without sacrificing comfort because a keyboard’s footprint doesn’t increase, meaning you don’t have to move further and further off the home row to access these extra key commands. 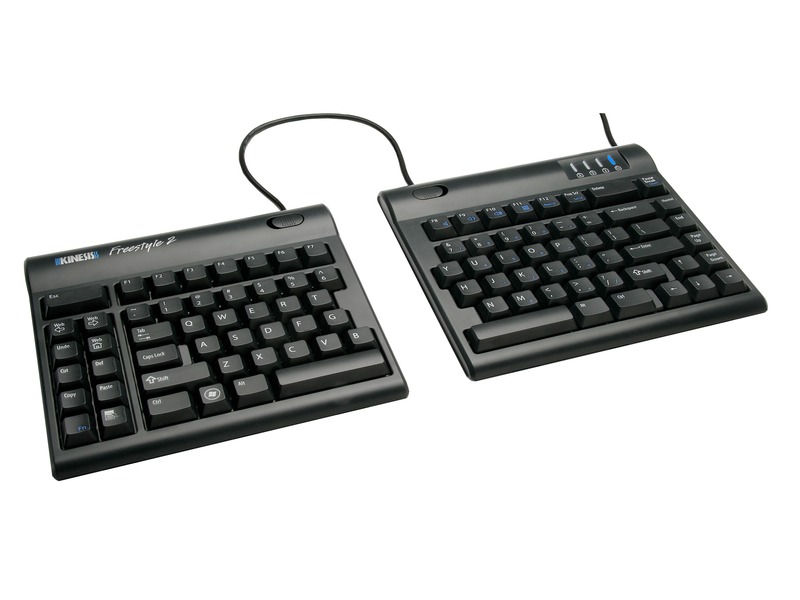 All Kinesis programmable keyboards feature dual-layer layouts, where each layer can be accessed by either a “shift” or “toggle” action which can be positioned anywhere on the keyboard. Pretty cool, huh? 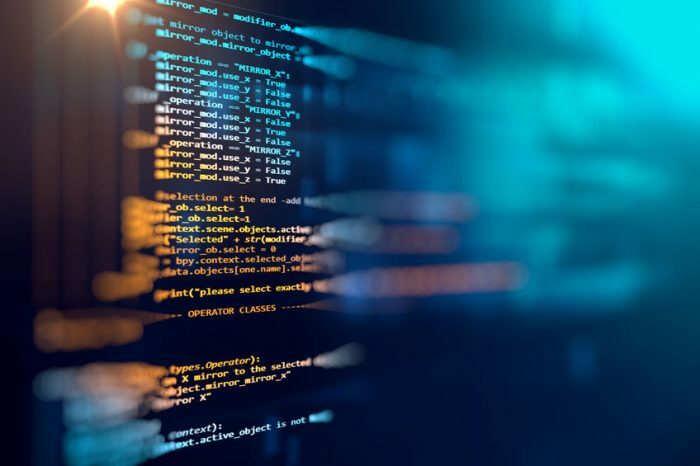 We like to put the standard 10-key actions in the embedded layer to reduce mouse overreach, but each key can be independently programmed to perform hard to reach keys, multimedia actions, macros, and much more. It’s virtually limitless! Keyboard macros are powerful productivity tools which can be used to cut down on repetitive keystrokes or eliminate awkward key combinations. A macro is a series or combination of keystrokes triggered by a single key press to save time and effort. Simply identify a key sequence (any combination of text or key actions) that is repetitive or awkward to press, then identify a more convenient “trigger key” that will substitute for that key sequence. The trigger key can be 1) a key you don’t otherwise use, 2) the embedded layer action for a key you do use, 3) a unique key combination using a modifier key (e.g., Ctrl + F1), or 4) one of the extra hotkeys found on the Freestyle Pro keyboard. What makes a great macro? The best kind of macros are those that replace frequently used key combinations, key sequences, or text phrases. Macros are highly individualized and application specific. Think about your workflow all the repetitive tasks you perform throughout the day, and then ask yourself which of those could be converted to a macro to save time. Create a custom layout on your Freestyle Pro and assign these macros to the dedicated hotkeys for one-touch access to your favorite shortcuts. If you’re on an Advantage2, assign the macro to a 2-key combination using the thumb-mounted Ctrl and Alt keys for maximum productivity. Virtually all programmable keyboards require the installation of special software on your computer to support macro programming, editing, and playback. That’s not the end of the world, but many people prefer not to install unnecessary “bloatware” on their computer if they can avoid it. 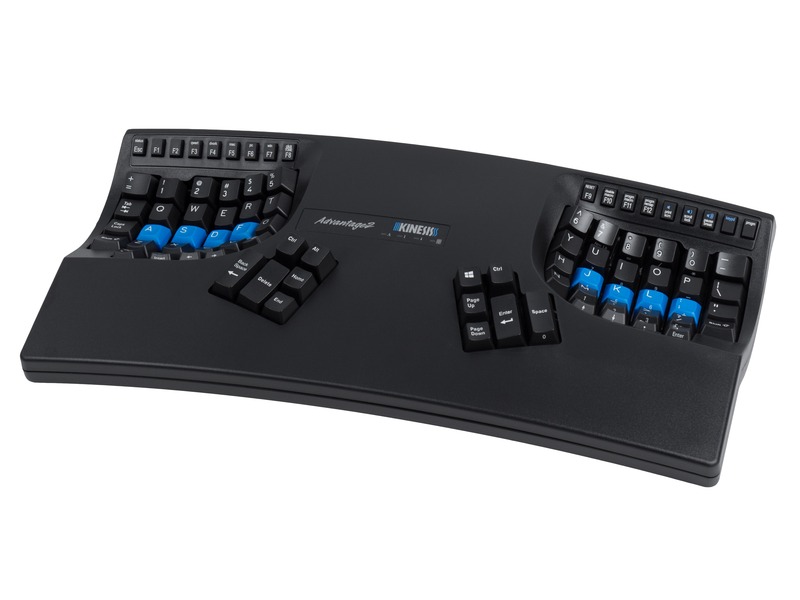 The Kinesis Advantage keyboard has long been synonymous with macros, but our new SmartSet™ Programming Engine found on the Advantage2 and Freestyle Pro makes macro capabilities even more powerful. Now you can record and save hundreds of “heavy-duty” macros right to the keyboard (“on-the-fly macro recording”) using a simple onboard shortcut without installing software or special drivers. The macro can be assigned to one or more “trigger” keys in either the top layer or keypad layer for easy access. Once you’ve recorded a macro, you can even view the macro contents and make changes to the macro or its trigger by a process called “Direct Editing”. Even copy it to another keyboard or layout with a simple cut and paste function. If you’ve ever tried to record a long macro you’ll appreciate just how powerful this is. For complex macros, or users who just prefer a graphical interface for programming, Kinesis offers the no-install SmartSet App. The App lives on the keyboard’s v-Drive so it never has to be installed on your computer! Launch the App to program macros from scratch, or edit an existing macro, you can even change global macro playback settings to optimize performance. Another common complaint about macros is playback speed. Most keyboards play macros back at one speed. But invariably macro speed can be too fast or too slow depending on the macro. 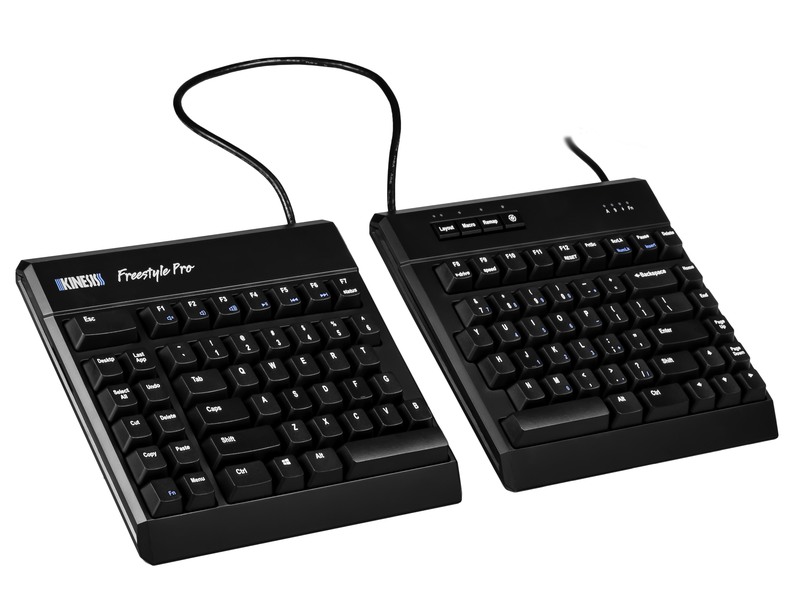 With the Advantage2 and Freestyle Pro, you can adjust the global macro playback speed from a modest 100 words per minute (“WPM”) all the way up to a blazing fast 3,000 WPM. You can even set the playback on macros individually in case some require faster or slower playback. Whether you’re a seasoned macro user or someone just starting to explore the world of keyboard macros, the Advantage2 gives you the most powerful macro toolkit available. On the Freestyle Pro, we’ve added the Multiplay feature which lets you program a macro once and set it to be played back a specific number of times with each trigger event. Great, I’m convinced! What Macros are Right for Me? This is the most commonly asked question we get about macros, but it’s really the most difficult to answer. Macros are intensely personal and depend on the individual user, their keyboarding preferences, and of course their workflow. 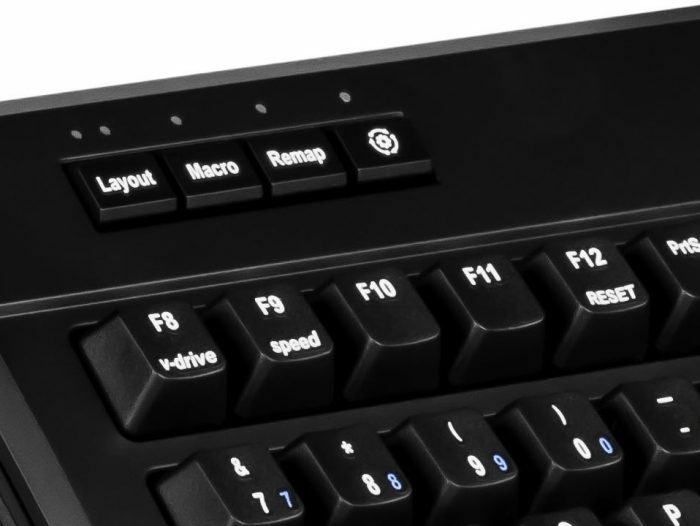 Macro keyboards are also popular in PC gaming where the ability to rapidly trigger a number of sequential actions with the touch of a button is a powerful weapon. Regardless of why you use macros, once you gain familiarity with their capabilities you’ll quickly find dozens of applications for them. Have you ever tried using a PC keyboard on a Mac computer, or vice versa? It will usually work okay, but some keys may not function properly and others may be in a different location than you were expecting. With a programmable keyboard, you can configure your layout to be used on different operating systems without making tradeoffs or having “dead” keys. On the Advantage2, we take this a step further with our pre-configured “Thumb Key Modes” for either Windows, Mac or PC/Linux use. Rather than custom programming the keyboard, just use our simple onboard shortcut to toggle the keyboard to activate Windows Mode, Mac Mode, or PC/Linux mode. On the Freestyle Pro, toggle over to Layout 2 for a customizable Mac layout that optimizes the modifier keys and office hotkeys for playback on Mac OS X. Both keyboards include extra Mac keycaps so the key legends match the key actions.